Melissa Nigi completed her chef training in Bristol England at Brunel Technical College, and currently holds an up-to-date City Of Ottawa food handler’s safety certificate. 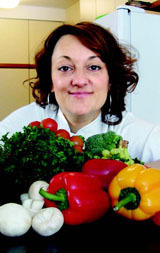 Melissa opened Marvelous Mouthfuls gourmet cooking service in Halifax in 1994. After 12 years of building her reputation on the East Coast Melissa moved Marvelous Mouthfuls to Canada’s capital Ottawa, Ontario where she quickly built a name for herself. Melissa is very experienced in meeting the unique nutritional requirements of individuals, families and groups, Melissa can prepare meals ranging from good homestyle cooking to gourmet, specialized dietary needs including dairy free, vegan, vegetarian, wheat free, low-fat, low salt, gluten free, high protein, low carbs, Keto, food sensitivities or allergies, organic etc. Melissa Specializes in extreme restricted diets. Although Melissa is not a nutritionist, she has a wealth of experience and information on how to maintain and enjoy a healthy diet. Everything is made fresh from scratch on the day of clients order with very minimal use of processed or packaged foods. Her menus are very extensive and tailored in detail to the clients needs & taste. References & police check available. Ottawa's Personal Chef Service in operation since 1994. Delicious freshly made meals to put in your fridge and freezer, tailored to your taste and dietary needs. arvelous Mouthfuls Provides you with your very own chef who designs menus tailored to your dietary needs and taste in detail, shops for groceries, prepares delicious meals made fresh on day of order and placed in labeled portion size containers to put in your fridge or freezer. It’s as easy to set up as hiring a house cleaning service except you’ll have delicious meals and a clean kitchen! First order: 3 easy steps! During phone call we will discuss your dietary needs and tastes, we’ll choose a menu, book cooking date and answer any questions you have (meeting in person rather than phone call is possible if preferred). I arrive at your home with my cooking equipment and groceries, cook your menu and leave your kitchen beautifully clean (Where extreme food allergies may be an issue, I will use clients equipment rather than mine)! For further orders: Check out the Menu page and text, email or phone what you’d like. I can also send a suggested menu. It’s that simple! Those who are unwell - I have years of experience cooking for cancer patients etc.